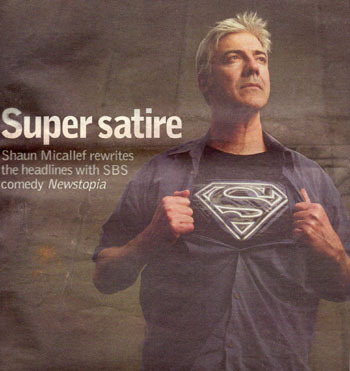 Rewind: Newstopia begins on SBS – Shaun Micallef Online! It was October 2007, and the industry was abuzz of a new show on SBS. Some were already comparing it to The Daily Show with Jon Stewart. But this was something unique – Australian, absurb and very Micallef. Described as the “luckiest unsuccessful” comedian in Australia by The Age Green Guide, Micallef was quoted as saying “I’m a white-faced comedian rather than a red-nosed comedian. I don’t have baggy pants and a ‘love me’ attitude. If you want to find the joke, it’s here somewhere. You just have to look for it.” This goes some of the way why some people might ask: what’s so funny about this guy. To which an equal number respond: everything. Memories of Micallef Tonight still loomed, even 4 years later. And Shaun himself acknowledged some of reasons why it didn’t work: his lack of experience, the overly-fast-past alienated some viewers – but he was still immensely proud of it. Shaun himself wasn’t sure Newstopia would be his ‘breakthrough’ success (leaving “target demographics” to the bean counters); he would just try to be funny. I am so pissed off I missed Newstopia when it was on. I’ve only seen what’s on Youtube. Do you reckon it will eventually be put out on dvd? I’m of two expectations – topical series don’t normally get put on DVD, with obvious exceptions like Chaser’s War. But with Shaun’s growing popularity, and the undeniable fact that it’s one of his best shows, hopefully?